Kevin Mejia’s favorite part of the conference was being able to share his experiences with the new people he met. Kevin Mejia, from Yonkers, N.Y., has always been passionate about traveling. During his time at RIT, the fourth-year business management and international and global studies double major has traveled to France, Germany, England and Cuba through the RIT Education Abroad office. In addition to his study abroad experiences, Mejia has also traveled to roughly 18 countries, including several countries in Central America, South East Asia and Europe. He also worked in Hong Kong for summer 2018 at the John Hopkins Center for Talented Youth program, and plans to return during summer 2019. 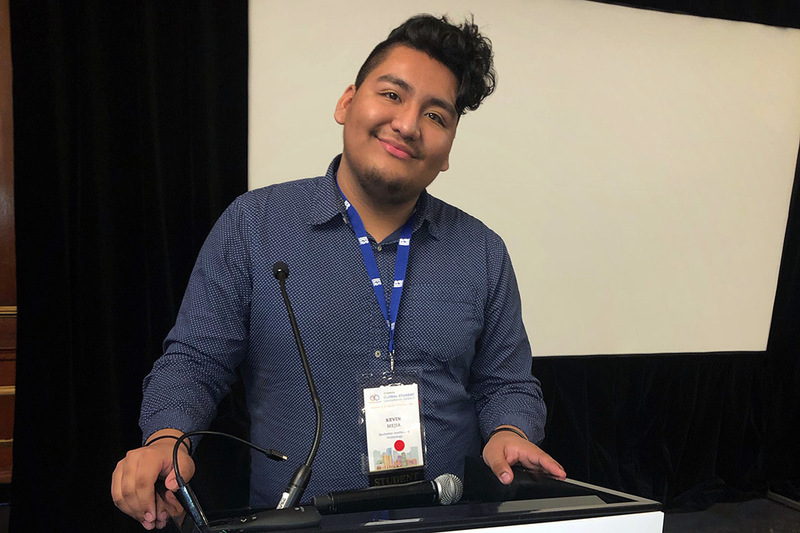 Mejia’s passion for travel and international education earned him an invitation to the fifth annual Diversity Abroad Global Student Leadership Summit, which was held March 2- 5 in Boston. The Global Student Leadership Summit (GSLS) is a national leadership conference for students from diverse backgrounds who have participated in international education programs. The goal of the conference is to develop “skills essential to being a successful leader in a global society” by strengthening students’ skills in leadership, self-awareness, communication, team building and embracing diversity. As a student, Mejia has taken on many leadership and community roles, including being a residential advisor, a RIT Global Ambassador and a peer advisor leader for international student services, and being part of the Travel Club, Global Business Group and the Phi Delta Theta fraternity. His community involvement combined with his passion for international studies made Mejia the perfect candidate for the GSLS conference. For more information about RIT Education Abroad, studying abroad or the GSLS conference, email Mejia at kxm4327@rit.edu or go to https://www.rit.edu/academicaffairs/global/study-abroad. Question: Why were you interested in studying abroad? Answer: I’ve been traveling since I was young and have always been interested and passionate about traveling. I found out about the study abroad and RIT Global office on accepted students’ day. A student who had studied abroad was sharing their experiences and it inspired me to study abroad as well. During my first year, I had already started researching about studying abroad and what it was like to travel and learn somewhere else. I figured things out really early because I knew I had to go at minimum for one semester, and by the first semester of my second year I was already gone on my first program! Question: What is one of your favorite memories from studying abroad? Answer: My favorite place was hands-down Berlin, Germany. I loved the culture, the city, the vibes, the food and the people—everything was great in Berlin. I feel like my favorite memory was getting to know the people I was with. I was on a global scholar’s program, so we were traveling with the same group of people to all three countries. Since we traveled together, we got closer than some of the other groups that were already at the different sites. It was really great making those friendships, getting to know them, traveling with them and getting lost with them. Question: How did you react when you got your invitation to the Global Student Leadership Summit? Answer: I was super excited. I had never been to a conference before, and it’s my fourth year, so I was really happy that I got the chance to go. I’m really passionate about studying abroad and international education in general, so it was really exciting for me to actually go to the summit and be with other people who have studied abroad. After a while of telling your friends about your study abroad experiences, they get tired of it and don’t want to hear it anymore. Being able to go and discuss it with people who were genuinely interested was a very special experience. Question: What sort of activities and workshops did you participate in at the summit? Answer: The main topic of the whole conference was personal identity and education abroad. So we reflected on our identities before, during and after studying abroad. I heard other people’s stories and shared my own, and I got the opportunity to reflect on topics that wouldn’t normally come up in conversation with friends. We all participated in a welcome and innovation competition, which is similar to Tiger Tank where you listen to different pitches and ideas, and we got to vote on our favorite ideas at the end of the presentations. There was also an exhibitor fair where people were able to present their research on education and diversity abroad. We had many opportunities to network with professionals that ranged from high school educators who worked with study abroad programs, to college study abroad advisers, to people actually working in the industry. It was great connecting with them, listening to their stories and how they got to where they were. It inspired me to rethink my life path and goals. Question: In your opinion, what was the most beneficial activity or workshop? Answer: I think the opportunity to network with other students and professionals in the field was the most beneficial. In my opinion, networking is one of the most important things someone can do; it’s the key to success. When you network, you have so many more opportunities for different positions. Knowing more people is great for students, it can help you develop long lasting relationships and get you many job opportunities. Question: How do you think attending this summit will help you move forward in your studies and future career? Answer: In terms of career, like I said, it was really eye-opening to learn about other people’s paths, and it inspired me to start thinking about my own path. My experiences at this conference made me think seriously about applying to do my master’s degree abroad or even teaching abroad. As far as here on campus, I want to talk with the RIT Education Abroad office, share my experience from the conference and talk with them about how we can keep providing for diverse students studying abroad at RIT, like providing a pre-departure session for diverse students. We have other pre-departure sessions that prepare students for their study abroad trips, but having a session specifically for diverse students would be helpful because they may have different experiences. I want to help the RIT Education Abroad office continue to do a good job through what I learned at this conference and my role as a Global Ambassador. Question: What advice would you give to someone who is interested in studying abroad? Answer: I always tell everyone to just do it. Honestly, there are no negatives to studying abroad. I know it sounds cliché, but studying abroad is the best thing that could ever happen to you. There are so many personal and professional benefits you get from the experience. You get a new perspective on your major, a new perspective on yourself and you learn and grow as a person. You truly get out of your comfort zone as you learn about these other cultures. I also recommend thinking about what you want to gain from the experience before you go, whether it be learning a new language, learning about a new culture or just trying something new. Everyone at RIT can study abroad. Our office is really great, just come talk to us about your options.